VICKY & STE// Happy 1st Wedding Anniversary to the beautiful couple Vicky and Ste! As Vicky stepped into our boutique, her sense of style blew us away and we knew right away that we would love her to find her dress with us. Not only is Vicky insanely stylish but she is absolutely beautiful and has a fabulous sense of humour! We were incredibly proud to be part of her bridal journey and love that we are able to share with you, her wedding story. Vicky and Ste met as he used to see her car drive past his pizza shop and eventually Ste plucked up the courage to ask if Vicky fancied dinner. It wasn’t pizza though and to this day, 9 years later he still hasn’t made her a pizza! Many years later, Ste romantically proposed to Vicky in front of her Mum and beautiful daughter Bella on the steps of the Grand Casino in Monte Carlo. Vicky explained that Ste asked her Mum to take a family photo on the stairs and when she had finished trying to get Bella ready for the photo, there he was on one knee with his Mum’s diamond ring in hand. She cried so much that he had to ask twice for her answer! 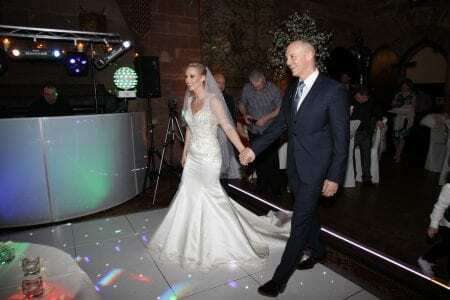 The engaged couple chose the idyllic Peckforton castle as their Wedding venue because of its incredible fairytale setting, plus the food is delicious! Next on Vicky’s list was her Bridal gown. Vicky said “I drove past Liverpool Bridal Boutique literally every day and was always mesmerized by the gorgeous gowns in the window – I still drive past now and look all the time – how I’ve not crashed I’ll never know, so I knew I wanted to get my dress from there.” We tried lots of different looks with Vicky and had such fun with her and her family. Vicky tried on a satin fishtail Allure Bridals gown and instantly fell in love with its elegance, intricate Swarovski crystal back and all round old Hollywood glamour style. She looked absolutely sensational! Vicky and Ste invited 60 of their closest friends and family to their ceremony with an additional 50 invited for their party. They made a whole weekend of it as 24 guests stayed the night before the wedding, all had dinner together, breakfast together and then prepared for the Wedding. Their theme was just pure fun and laughter, although there were a few happy tears along the way. 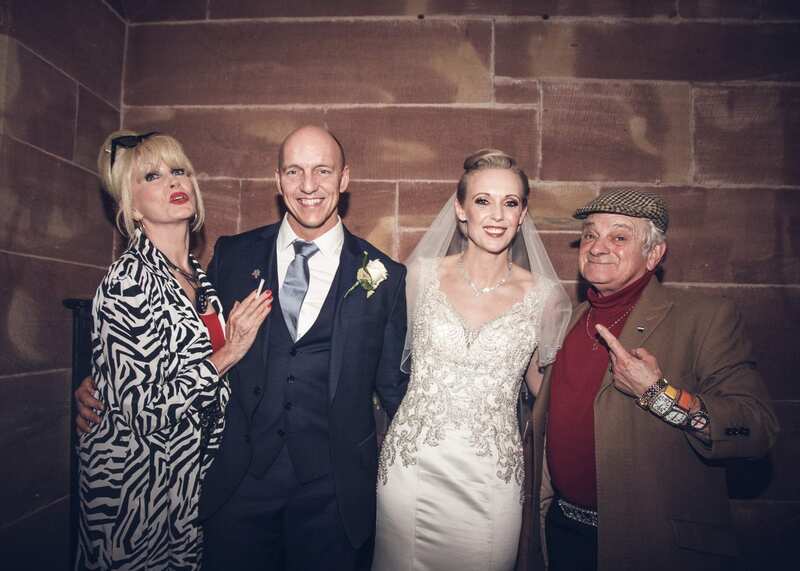 They surprised their guests throughout the day, with a barn owl delivering the wedding rings, Del Boy and Patsy (Ab Fab) impersonators – both for entertainment during the wedding breakfast but also because Ste was too nervous to do his own speech. In the evening they had casino tables, a saxophonist and bongo player and danced the night away! It’s your wedding, be a bridezilla if you want to, invite the people you want there, don’t compromise on the people you love being there for someone you hardly see or speak to. Pick a dress you love but you can eat in too! Have a videographer, they capture so many things you don’t see and bring back so many memories. Take a step back occasionally throughout your day and watch people enjoying themselves and make memories. When you say your vows, remember it’s your husband or wife to be you are saying them to not the officiator. When you go to the loo walk over the toilet and face the back of the loo – much easier in a big dress. The post wedding blues is a real thing so pre-plan something to do to occupy yourself after the wedding. Vicky and Ste’s wedding reflected them perfectly as a fun, family orientated couple and it was an absolute pleasure for LBB to be a small part of it. Vicky was a joy to be around, she enjoyed every second and took everything in her stride. I think you would agree that she looked undeniably stunning and we sincerely wish you the best for your future as husband and wife!